I arrived at the V&A’s current exhibition Alexander McQueen: Savage Beauty with the highest possible expectations and left without a single one disappointed. Having looked forward to this exhibition for over a year and reading a huge number of articles in recent weeks I thought I would be prepared for the many wonders that are on show. 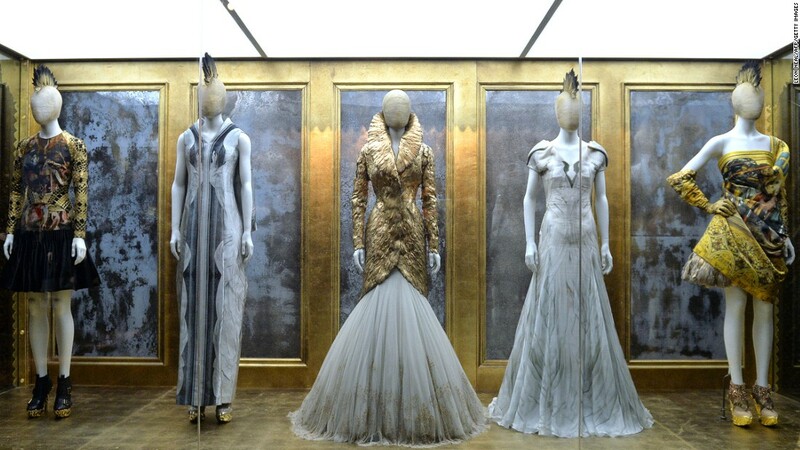 However, it is only when you see the full variety of McQueen’s output together that you can appreciate the strength and imagination of his vision. There were ensembles that unsettled me, dresses of unworldly beauty and shoes which appeared to defy physics. In addition to this each room attempted to capture the essence of that particular collection and immerse the viewer in this idea, through both visual and audio accompaniment. This makes the exhibition an experience in itself, with even the walls complimenting the exhibits with one room filled with gilt framing and another almost like an ossuary. McQueen’s talent for tailoring is evident throughout the exhibition, as his clothes manipulate the potential in the human form to create a variety of shapes. 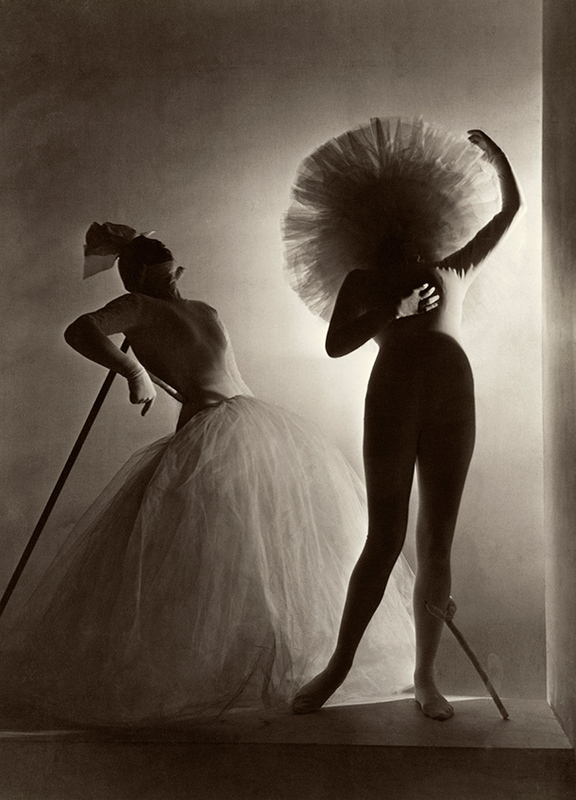 He learnt his skills through working on Savile Row and this confident knowledge allowed him to ignore the carefully honed rules to suggest new ways of viewing the body. He elongated the back to focus on the end of the spine by changing the cut of trousers, a principle which became sensuously clear as models walked down the runway in his “bumster” trousers and immediately entered the fashion consciousness. 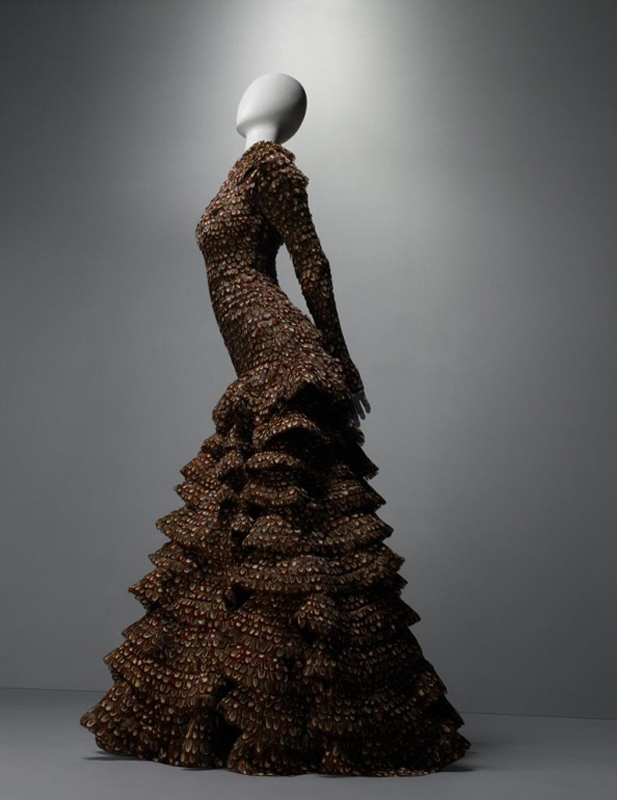 I was also fascinated by McQueen’s choice in fabrics, as he often married classic silhouettes with unconventional material. Feathers feature throughout his collections, sometimes flamboyantly but also discreetly, as in the dress above. Although feathers are often used to create lightness in clothes or suggest a carefree lifestyle McQueen’s dresses frequently reject this as the feathers are coated in paint or modified to reveal a harshness which is not immediately apparent in natural feathers. 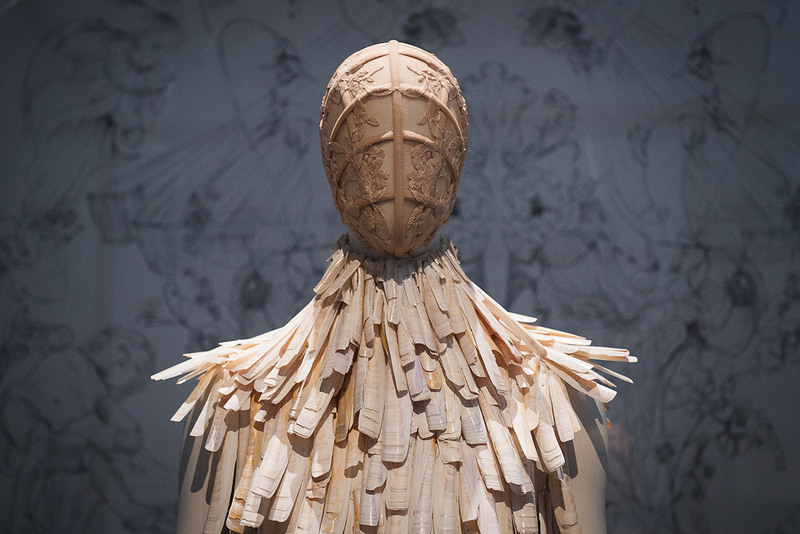 This unnerving technique was also used with other textiles such as flowers, shells, hair and metal but throughout this the careful tailoring continues to link his creations with their fashion predecessors. The variety of works involved in the exhibition becomes overwhelmingly apparent in ‘The Cabinet of Curiosities’ room, which is filled, floor to ceiling, with hats, dresses, shoes and so many other objects that I had no idea where to look first. There was a skirt which relied on the shadow it created, a butterflied hat, silver jaws and chain mail to name but a few, with all the walls playing videos from many of the fashion shows these objects originally featured in. The inclusion of these catwalks allowed me to appreciate the objects as part of a larger setting and also reminded me of their original purpose, even when the practical seemed implausible. The shape of the armadillo heels is unusual but when looking at lines of models walking in them I was struck by how much more alien they appeared when worn as part of the human body. They altered the walk and posture of each model and therefore changed the ensemble completely. This effect was only enhanced by the numbers of models involved and it became clear that McQueen viewed his fashion shows as an essential aspect of each collection, therefore making them as theatrical as his clothing. Each piece cannot be truly appreciated in isolation. The exhibition is open until 2nd of August and I cannot recommend it enough. It is a kaleidoscopic opening into the mind of a man whose imagination could finesse sublime creations but also reveal nightmarish visions. Alexander McQueen always presented women as powerful, almost frightful, beings and as the exhibition title suggests he did not believe in commonplace, soft beauty. This combination of harshness, strength and aesthics exposes the accepted standards in fashion from within and forces the viewer to question their own visual ideals. Nevertheless, if you still need convincing about what you might see the V&A have provided further information about some of the intriguing objects on display. It’s also an excellent way to see the careful detailing present in all of McQueen’s work and appreciate the variety of skills involved. However, there has been unprecedented demand for tickets so make sure you plan a visit well in advance. The title of the Design Museum’s current exhibition, Women Fashion Power: Not a Multiple Choice, immediately caught my eye and I was interested to see how they might explore the concepts when I started noticing their posters around London. An exhibition which promises to show the wardrobes of both Margaret Thatcher and Lady Gaga is bound to intrigue. The Design Museum itself is worth a visit as it is a striking white building set on the edge of the Thames near Tower Bridge. However, there are plans for the museum to move from it’s current home to another in South Kensington to enable a permanent, free collection to be showcased. Inside the Shad Thames building everything is carefully chosen and stylishly Spartan. My favourite part of the building was a swirl of handing lights which descended in the middle of the stair case to be reflected by a mirror at the base. This emphasised the unusual light bulbs which featured and were also part of an installation elsewhere. Unfortunately while I enjoyed visiting the museum itself I was less impressed with the exhibition I had come to see. 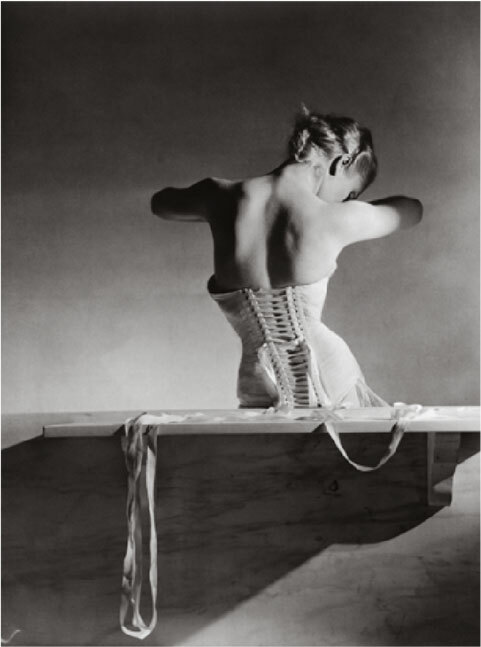 I had expected an examination of how particular women had either used fashion to demonstrate their power or how fashion had bolstered claims to strength and power. Instead the exhibition started with brief allusions to tired examples of powerful women across history, such as Boadicea, Elizabeth I and Hillary Clinton before chronologically presenting the development of female fashion with basic explanations. Corsets were followed by flappers, the New Look and shoulder pads and I struggled to see how this illustrated women empowered by fashion. The lives of women continued to appear to be restricted by their clothes as stays, tights and heels all dictated the limits of how they could act. I was also frustrated by the layout of the exhibition as the panels were close together, channelling people and quickly creating bottlenecks of necks craning to see an item or some information. Therefore it was easier to go round the exhibition out of order, choosing to dart between decades as empty spaces appeared. The exhibition really came alive towards the end when it featured the clothes of modern successful and professional women. They ranged from Zaha Hadid to Camila Batmanghelidjh and also Lady Gaga. I was immediately engaged by how each woman uses fashion in her professional life, reflecting both her personality but also the practicalities of the job. While some featured Zara dresses or their everyday suits others chose the Chanel handbags they bought to celebrate achievements or custom made jackets. Hadid’s jacket appeared as structurally sound and fascinating as any of her buildings while Batmanghelidjh’s dress sewed together fabric she received from the children she helps and works with and she often rearranges the selection as time passes. The variety of this display proved that fashion can branch out in a myriad of directions and a single narrative cannot hope to capture this. Without a doubt my favourite dress in the exhibition was Lady Gaga’s dress made out of bin bags. The material was so carefully cut, shaped and styled that it was difficult to believe that it is also commonly disposed of throughout households in the land. 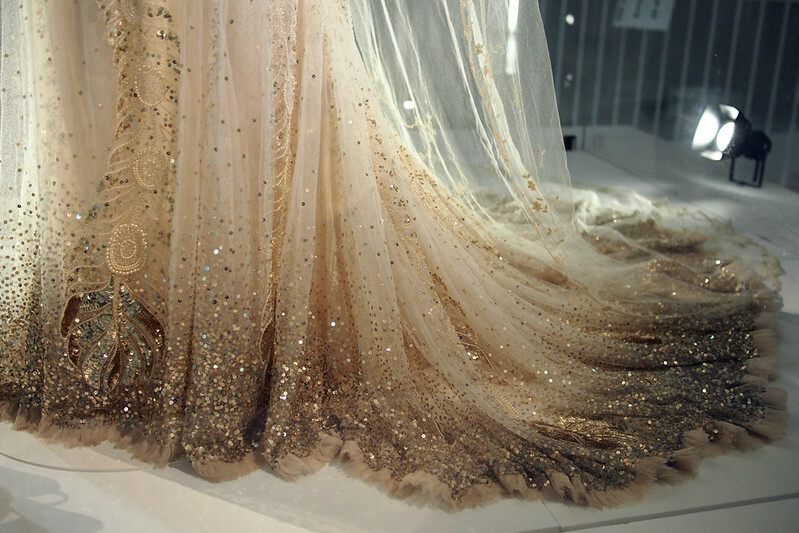 The dress cascaded and fluttered, even as it was worn by a motionless mannequin so I can only imagine the effect it would have when worn by a living, breathing Lady Gaga. I have to admit that while I loved the dress I am unlikely to attempt to recreate it myself as I can imagine that it can become rather too warm to wear. Nevertheless, this reassessment of what can constitute fashion was a wonderful way to end the exhibition. The exhibition continues until the 26th of April. I was very excited to receive my copy of the first edition of The Happy Reader in the post recently. The magazine is a joint enterprise between Penguin and Fantastic Man to celebrate the luxuries embodied by print and the art of reading itself. 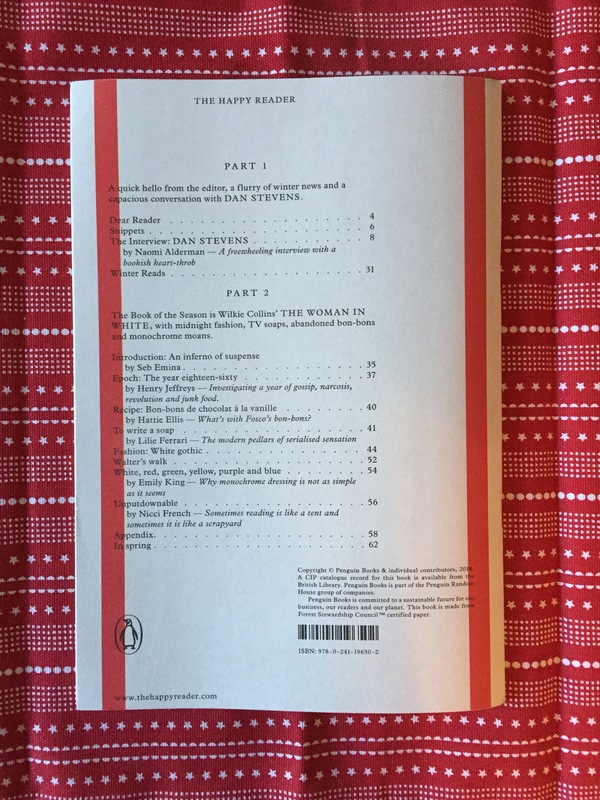 They promise that each issue with feature a lengthy interview with a famous reader, whether they are primarily known for reading or not, followed by an in depth exploration of a classic book, in this case The Woman in White by Wilkie Collins. 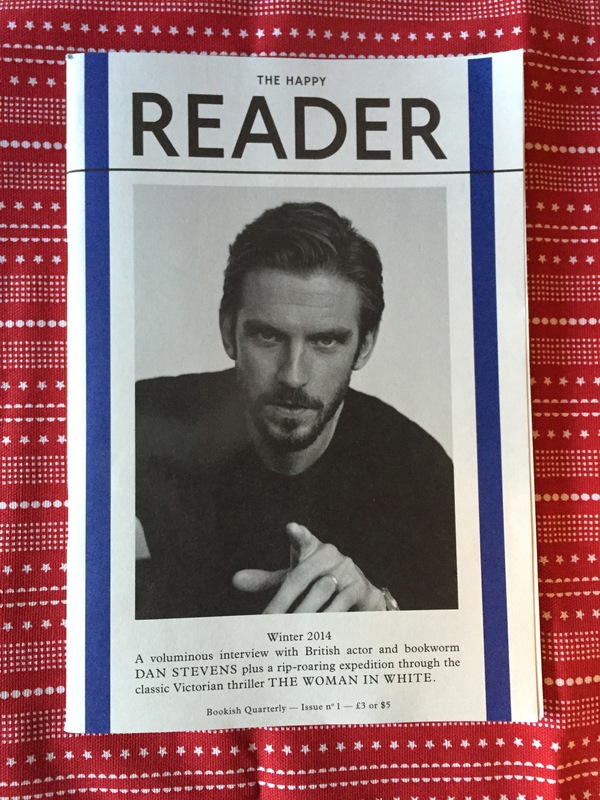 They have had a very strong start with an interview with actor and Booker prize judge Dan Stevens which meanders over studying literature, reading to children and not least starring in a range of literary adaptations. 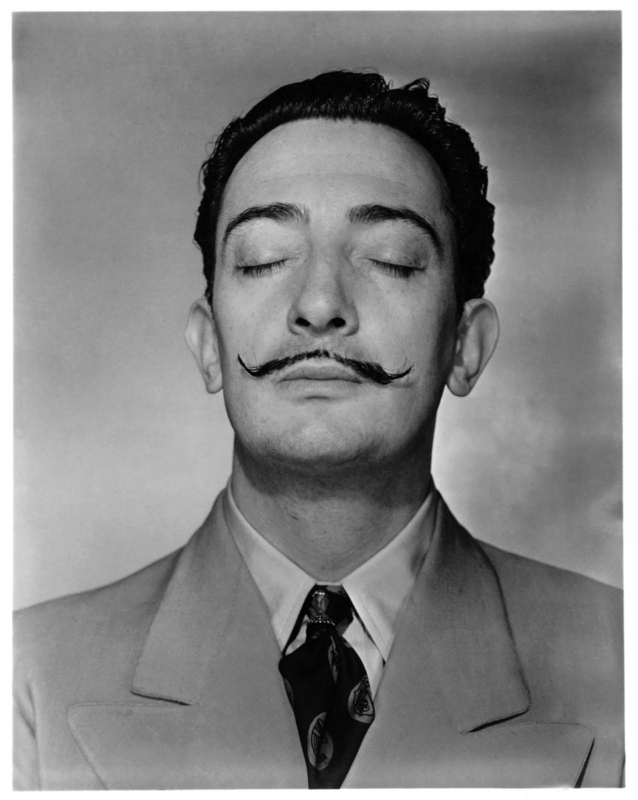 This is all accompanied by black and white photos of the man himself to make the experience even more luxurious. At times it felt that unnecessary amounts of detail were reported in the interview, such as discussions with a waitress regarding a glass of water, but overall it was very interesting to read about how Stevens approached reading around 140 books when judging the Booker prize whilst still being on set for Downton Abbey – apparently his Kindle was never far from his hand. The interview ended with several recommendations from Stevens and it has prompted me to search out Of Walking in Ice by Werner Herzog which sounds fascinating and heartbreaking. The Woman in White is a book which I have read many times and so know the twists and turns of the Victorian Gothic plot inside out. The opening scene where Walter Hartright glimpses a woman dressed solely in white in the dead of night on Hampstead Heath sets the tone for unexplained and unnerving events throughout the book which does not let up or disappoint. It involves an evil count, one frail invalid with a fiercely devoted sister and a dastardly plot to steal an inheritance which Hartright stumbles upon when he takes a new job as a drawing master. 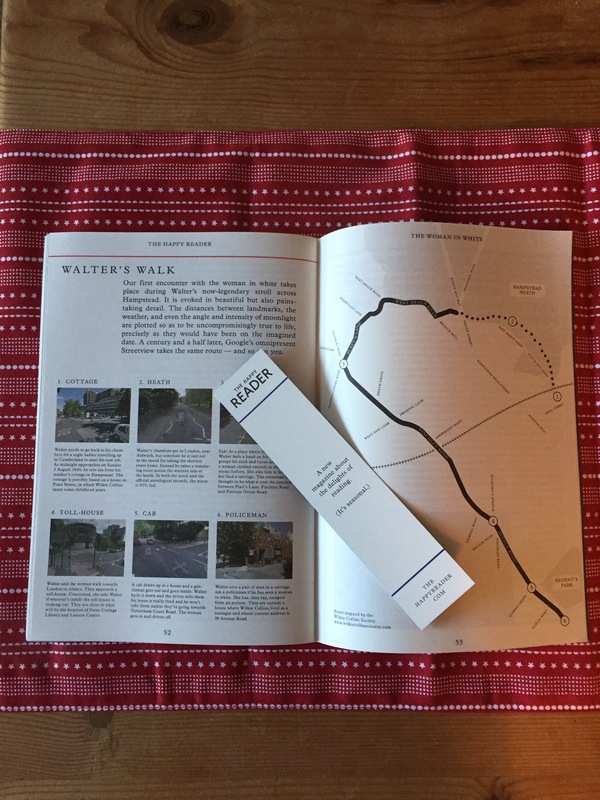 The Happy Reader takes this intricate tale of love, betrayal and deception and produces fashion pages, recipes and recommendations for walks alongside reminiscing around the book itself and pieces on its history and genre. I particularly enjoyed the article on the links between the colour of a character’s clothes and their identity in film and literature. Emily King suggests that single-coloured outfits pigeon-hole women as either saint, whore or crazy while men are allowed to reveal more of their identity through their clothes. There is a great feel to the The Happy Reader and it really does make its reader appreciate the print form, with its thick pages and accompanying book marks. It also has lovely wide margins which are occasionally filled with an informative or whimsical side note, ranging from the timetable of a Brooklyn Ferry to information about Peter Capaldi or fan fiction. The magazine plans to produce a new issue every quarter and they have already announced that the next book to be featured is The Book of Tea by Kakuzo Okakuro. I’m already looking forward to the next issue and will definitely track down a copy of The Book of Tea to ensure I am ready for The Happy Reader‘s arrival. I’ll also be looking out to see if I can spot any other readers preparing and reading the book! At the moment they are doing some great deals on their subscriptions so if you’re likely to be interested I’d definitely recommend investigating the opportunities as The Happy Reader is likely to become popular fast. The attempt by the V&A to showcase several centuries of wedding dresses is admirable simply because of the inevitable range of the most personal dresses possible. They reflect lives, love and countless stories. I was amazed by the number of dresses that had clearly been passed down through the families before ending up in the V&A. There was glitter, sequins, and beads. There were long dresses, short dresses, suits and dresses made out of parachutes. Weddings are often demonstrated to join cultures and countries together, with their symbolism being adapted for every occasion. They show that whilst fashions are constantly changing weddings will always contain moments of significance. After several rooms full of white dresses Dita von Teese’s deep purple wedding dress was overwhelming in its sudden intensity. It meets the eye as you turn up the stairs from the older section to reach the upper floor. It was stunning and made me reassess the necessity of using white material to prove that a dress is wedding dress. The exhibition noted that although it was only after Queen Victoria’s wedding that the traditional wedding dress became expected to be white. However, as a reflection of a woman’s personality a white dress seems flat, a view which is compounded when so many white dresses can be compared against one another. Nevertheless, the shape and cut of this white dress still allowed it to stand out from the crowd. 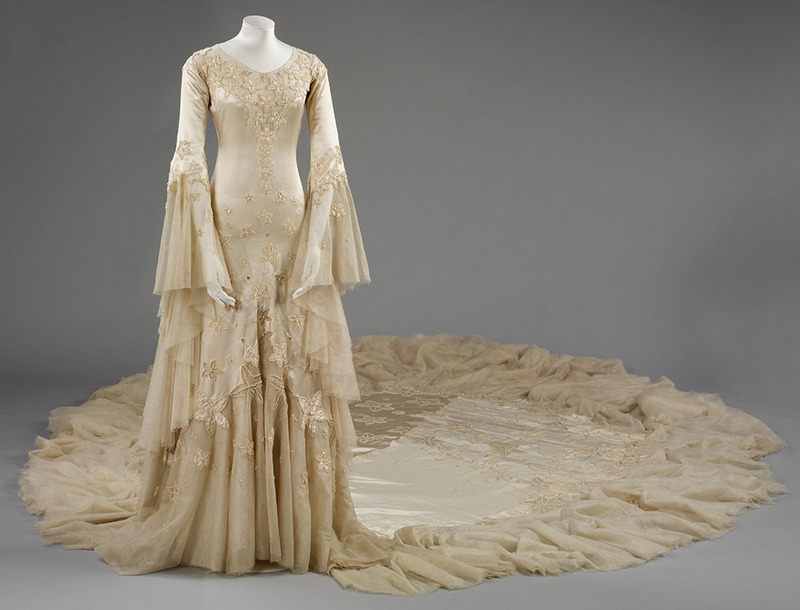 I leave the best dress until last – Margaret Whigham wore this dress for her society wedding in 1933. It was designed by Norman Hartnell (who went on to design both the wedding and coronation dresses of Elizabeth II), taking inspiration from the recent revival of interest in the medieval.The inbuilt train is stunning in real life as it seems to spread out like an iced lake. It would definitely look magnificent down the aisle. The exhibition continues until 15th March 2015 so there’s plenty of time to choose the perfect moment to go and see it.